Author’s Note: If fan sentimentality of any kind repulses you, please avoid the following essay. The relationship between Batman and Superman has fascinated me since I was a kid. Equal parts bickering couple, friends, and teammates, they are quite a combo. Their surface differences are interesting enough — Clark’s pastoral and idyllic upbringing (minus that whole exploding planet thing) vs. Bruce’s youth as the orphaned Prince of Gotham. But when a really good writer brings them together, you get a sense of their mutual respect and understanding, in spite of the way they often grate on one another. Though Bruce keeps almost everyone at arm’s length, there’s a certain we-don’t-have-to-discuss-it intimacy in his relationship with Clark. They are the Lennon-McCartney of the Justice League. Perhaps that ‘s why I responded so strongly to the image above (by Trocken via DeviantArt). I’m usually bothered by stories suggesting that Bruce and Clark encountered one another as kids, but there is something really believable and authentic about this. It has been my experience that opposites attract in friendships and in love. Therefore, I can see sunny, optimistic Clark homing on in brooding, intense Bruce on the first day of middle school and befriending him. I’m not saying they’d be going on double dates, but given their extraordinary backgrounds and mutual brilliance (and let’s not forget that Superman is brilliant), it’s plausible that some kind of relationship would develop. If Lex Luthor hadn’t been such a mega-douche and used his powers for good, he might have been a lot like Bruce. To borrow V.’s brilliant term, Batman and Superman are oppo-sames. (And yes, I know that this scenario flies in the face of canon and would likely result in a very different outcome for these characters, but just indulge me today, OK?) Uh-oh. We gotta quash that Clayface situation by the monkey bars. Some of my favorite stories involve these two, even when they’re about to scrap. Remember the scene in Darwyn Cook’s Justice League: The New Frontier where Batman almost defeats Superman using nothing but sheer will, cable, and a motorcycle? And then Superman is like, “I can’t be beaten by this … this … human!” More than a few times, Superman has said something along the lines of “You’re out of your mind, but I kinda like the way you roll.” And of course, they have kicked a lot of asses together (See: Public Enemies) and even saved each other’s lives. It’s significant that Clark entrusted Bruce with a bit of Kryptonite, just in case. In the Dark Knight Returns movie, the Joker famously says to Batman, “You complete me!” I think that line applies more to this dynamic duo. Over-zealous fans of any kind used to really creep me out. Having had more than one bout of spitting venom at the computer monitor on my own blog these last few years however, I’m learning that there’s a little bit of fan sentimentality in all of us. It may be a FB post on the overblown ego of a comic writer and his arrogance to think he could create a story that goes against character or contradicts or disregards altogether previous storylines. Or it could be a rant about a certain ignorant overpaid director frakking with the hallowed mythology of an epic cartoon and toy franchise (damn you Michael Bay, damn you to Hell!). I’ve learned to appreciate enthusiastic fandom in others, if only to find that certain someone who could prove to be weirder than me. The first image doesn’t do much for me, but that second one with the juice boxes, absolutely classic. I’d like to think it’s a defense mechanism, that in their circle of friends, co-workers, fellow students, etc… they get made fun of for their choices so they’re just trying to beat you to the punch. Unfortunately, our community is as full of flaming a-holes as any other. And yes, they probably would enjoy that. With those of us who are of the geek persuasion, even bad attention from a female is still attention. I’d like to give my bretheren the benefit of the doubt and say this behavior is really a defense mechanism. In their circle of friends, co-workers, students, etc… they’re made fun of for their choices, so they’re just trying to beat you to the punch. Unfortunately, even in our community we have our share of flaming a-holes. And yes, they probably would enjoy that. For those of us who are of the geek-persuasion, even bad attention from a female is still attention. Hee! I know what you mean, Craig. Fan attachment can go over the edge, and I have blown a fuse or two, as you may have noticed. There’s just something about Batman and Superman working together that makes me feel like a 9-year-old reading comics again. I mean, I’m not suggesting someone create a “Batman/Superman: The Wonder Years” book, but would I check it out? Uh, maybe. It looks like you’ve got the basic plot worked out (from the posts below). Maybe a weekly or monthly strip is in your future? I always liked and appreciated their friendship and mutual respect. They are like foils to each other, bringing out the best and sometimes the worst in each other like good friends do. I hate the stories/animated movies that don’t show that level of respect between the two characters, like the author thinks it makes Batman that much cooler if he expresses disdain or a dismissive attitude toward Superman. It doesn’t, I think it cheapens the relationship. I agree, I LOATH the way that Frank Miller writes the way that BM and SM interact. It is just soo immature and does not make BM seem cool just threatened by SM. I have a friend who writes fanfiction and often does that in his stories when he writes them. Its rather jank, and is far from clever. Not that either is better than the other it is much better when they understand and respect what each other brings to the League or what the other can do. Sadly it is when BM is written like that many readers form a harsh dislike of the character. exactly. Batman’s a bit of a hardass, we get it. But there’s a level of professionalism there too, at least toward who he considers his peers. Just because he chooses to work alone doesn’t mean he doesn’t appreciate and respect what the others bring to the table. It just gives him the freedom to do things the others can’t (or won’t) do. Batman would have a crush on her and, as boys do, express it in the most awkward ways possible (arm-punching, sarcasm, etc.) Superman would be her bestie, but he’d be a little annoyed that she had such awesome powers and didn’t need his help. 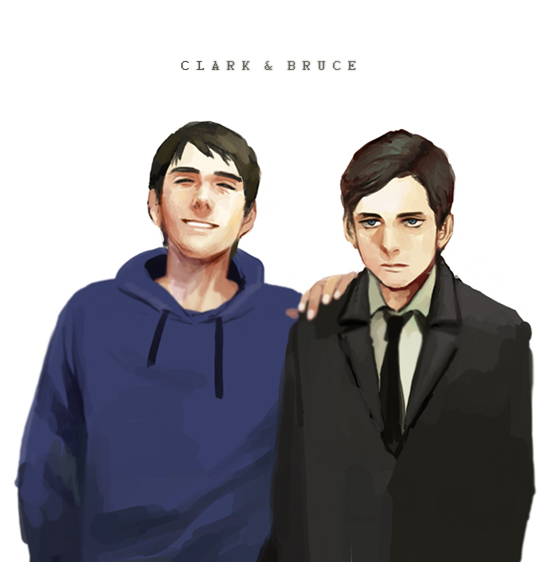 I love the bromance between Clark and Bruce. They’re such good pals! Thanks for the cool article!